Anna Atkins may not have been the first woman to ever take a photograph – that honour looks likely to have gone to Constance Fox Talbot in around 1839 – but she is the first woman known to have been a photographer. Atkins had access to a camera as early as 1841. She learned both 'photogenic drawing' and the calotype process from William Henry Fox Talbot, but it is her work with Herschel's cyanotype process that she is justly famous for. Herschel invented the process in 1842, and by 1843 Atkins, a keen naturalist, was applying it to the study of algae by making cyanotype photograms of dried samples. She self-published her studies in October of 1843 in a book entitled 'Photographs of British Algae: Cyanotype Impressions' - the first ever book to have been illustrated with photographs. This work was published in several parts between 1843 and 1853, with the titles and contents also being created using the cyanotype process rather than by being conventionally typeset. 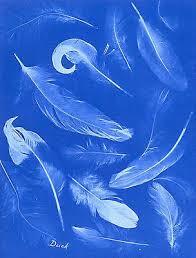 Her later photographic works – collaborations with Anne Dixon - include typologies of ferns and feathers. The rich, contrasting blue and white of a well-made cyanotype is a truly beautiful thing, and luckily for us, cyanotypes are very enduring images. 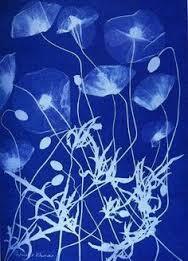 Also known as the 'blueprint' process, cyanotype's first applications were in engineering and architecture, but in Anna Atkins' hands the broader scientific applications – and the beauty – of cyanotypes, became very evident. Her works are extraordinary landmarks in the histories of photography, illustration and publishing.